A groundbreaking therapeutic model to assist practitioners treat sexually abused children effectively is presented in this pragmatic volume. While the model is applicable to both male and female children, the author focuses on boys. In so doing, Friedrich cites pertinent gender and sociocultural issues that are critical to understanding boys, an understanding which is in turn essential for the provision of adequate and effective individual, group and family therapy. "This carefully documented, well written text sets the standard for psychological assessment of child sexual abuse. It goes beyond the focus on just the child’s statement to argue for an integrated approach to evaluation that looks at the child, the child’s context, and the relationships in a child’s life. An excellent book, Dr. Friedrich’s work is a must read for anyone doing child sexual abuse evaluation. If you do any forensic child sexual abuse evaluation, you need to read this book. In a carefully documented, well written text it sets the standard for abuse assessment. Not only does it advocate an integrated approach to evaluation that includes information on the child, the child′s context and the child′s relationships, but it goes on to offer clear and helpful directions for gathering this information. A generous sprinkling of relevant case histories links theory to practice. This excellent book is a much needed contribution to the arena of psychological assessment in child sexual abuse." 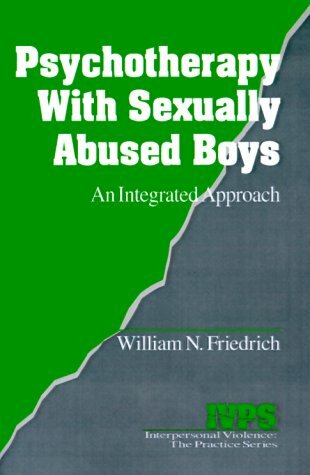 "In this book, Dr. Friedrich provides a thorough guide to assessing the constructs central to his three-part model for directing the treatment of sexually abused children and their families. What distinguishes this volume from others like it is Friedrich′s attention to the complexity of assessing theoretically critical aspects of child and family functioning, the practicality of the techniques described, and the wisdom of the author. The generous inclusion of many scales, interviews, and clinical aides should facilitate the application of Friedrich′s ideas among experienced and novice clinicians."